Your friends and family love seeing what you've been up to; with the Wi-Fi® enabled COOLPIX S5200, you can give them an amazing view! Capture breathtaking photos and Full HD 1080p videos with ease, instantly share them to your compatible smartphone, tablet or compatible Wi-Fi® device, then upload them to your favourite websites as usual. A 16-megapixel CMOS low-light image sensor delivers better image quality and lets you shoot in more situations without a flash, while smart features like Scene Auto Selector and Subject Tracking deliver optimal results with the least amount of fuss. Get the perfect shot in one take and share it without missing a beat! The COOLPIX S5200 makes it easier than ever to share beautiful views of your world. Take a great shot and instantly send it to your compatible smartphone, tablet, or any compatible Wi-Fi® device. Then use your smart device to email it, text it, or upload it to your favourite social networking or photo album sites—shared the same way you normally share images online. Your friends and family will be amazed by the shots you share! Imagine being able to shoot without a flash at weddings, concerts, parties—most places your flash normally fires. You won't have to interrupt a moment to capture it, and your photos and HD videos will look more natural and true to your memory. The COOLPIX S5200 performs so well in low light situations that, in most cases, using the flash is optional. Of course, when the lighting is extremely poor and you need a flash, it'll be there. 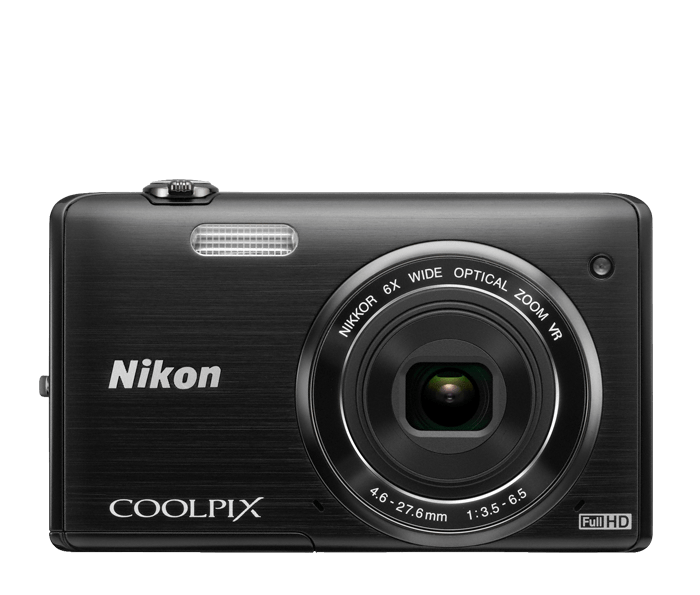 If you want a compact camera that shoots stunning Full HD videos, the COOLPIX S5200 delivers. 1080p Full HD means the ultimate in video quality. Record the action, then connect to an HDTV and watch your videos come alive. A built-in mic records high-quality audio in stereo. Your videos will look and sound phenomenal. Compose, review and share your photos and HD videos on a vibrant, high-resolution 3.0-inch 460,000-dot LCD display. Kids and pets are always on the go. Fortunately, the COOLPIX S5200 includes Subject Tracking, which automatically locks onto a moving subject and keeps it in focus until you're ready to take the shot. Not sure which Scene Mode to choose? No problem! Select Scene Auto Selector and let the camera make the call. From Night Portrait to Backlighting, the COOLPIX S5200 will optimize the Scene Mode for your situation. Create truly exceptional photos and HD videos in nearly any light. A 16-megapixel CMOS low-light image sensor delivers superior image quality, versatility and low-light performance. Based on Camera and Imaging Products Association (CIPA) standards for measuring the life of camera batteries. Measured at 23(-/+2)°C; zoom adjusted with each shot, flash fired with every other shot, image quality set to Normal, image size set to 4608 x 3454 (16.0MP). Battery life may vary depending on shooting interval and length of time menus and images are displayed.